Sioux City SAGE Direction Center DC-22 (1961-1968) - A Cold War SAGE System Direction Center first established in 1961 on Sioux City Air Force Station, Sioux City, Woodbury County, Iowa. Named Sioux City SAGE Direction Center after the location. Assigned a Sage ID of DC-22. Deactivated as a SAGE Direction Center in 1968. Established and became operational on 1 Dec 1961 as Sioux City SAGE Direction Center DC-22 operating as the Sioux City Air-Defense Sector (SCADS). This was the last direction center to become operational and it completed the SAGE program in the continental US. The computers installed at the Sioux City Direction center were originally FSQ-8 computers meant for a command center that was canceled. The FSQ-8s at Sioux City were upgraded to FSQ-7 specifications by adding input and output components that the original FSQ-8s lacked. Direction center equipment included the duplex FSQ-7 computer system and associated communication equipment. The FSQ-7 computer system assembled digitized inputs from USAF Radar Sites to provide tracking and identification of all aircraft within their sector of responsibility. The digitized radar inputs came from USAF Radar Sites, airborne radar pickets, Texas Towers, Gap Filler Radar Sites and other radar sources. The total picture of aircraft in the sector was assembled and any unknown aircraft were checked out and hostile aircraft were engaged by USAF fighter aircraft, Bomarc missiles or NIKE missiles. The primary defense was against the Soviet threat of a mass nuclear bomber attack on the US. The system evolved before the advent of ICBMs and provided no missile defense against them. The computer technology was first generation vacuum tube equipment and required significant power and air conditioning. The physical plant of the direction center was enclosed in a large multi-story concrete blockhouse that housed the duplex FSQ-7 computer, communications equipment, a powerhouse, air conditioning systems and operational areas. The operational areas included radar mapping, air surveillance, identification, communications and weapons direction. The enormous cost of the radar sites, direction centers, personnel, and training caused an immediate reevaluation and almost as quickly as they were built some facilities were closed. The first mass closures began in the 1960s when many radar sites and virtually all the gap filler sites were closed. The first round of direction center closures came in 1963 when six were closed, a second round in 1966 and a third in 1969 that closed a total of 17 out of 23. The remaining six direction centers became SAGE Regional Control Centers (RCCs) still using the massive FSQ-7 vacuum tube computers. As the direction centers and radar sites closed the remaining sites were realigned into ever-increasing sectors. A new Joint Surveillance System (JSS) evolved as a partnership between the Air Force and the FAA to provide nationwide radar coverage. When completed in 1983 it consisted of only forty-six radar sites feeding into four new Region Operation Control Centers (ROCCs) with FYQ-93 computer systems. With the activation of the four U.S. ROCCs and the two Canadian ROCCs, the last seven of the SAGE direction centers were deactivated and this signaled the end of the SAGE system. Of the remaining forty-six radar sites, thirty-one had FAA-operated search radars and USAF operated height finders. Five sites just had FAA search radars and only ten sites were operated by the Military. With the deployment of forty FAA ARSR-4 3D radar sets in the 1990s, the earlier military and FAA radars were replaced. The Canadians closed their underground SAGE Direction Center and created two ROCCs (CAN-East and CAN-West) using the FYQ-93 computers in the underground facility. The Sioux City Air-Defense Sector (SCADS) was deactivated on 1 Apr 1966 and the 30th Air Division took up operations at the Sioux City SAGE Direction Center DC-22 until 18 Sep 1968. The 30th Air Division and Sioux City SAGE Direction Center DC-22 were both deactivated on 18 Sep 1968 in the third round of closures. 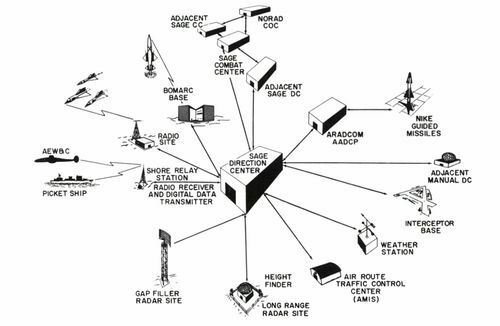 Most of the attached radar sites were also closed at the same time and the one remaining site, Chandler AFS, was transferred to the 29th Air Division but ceased radar operations less than a year later on 2 Jul 1969. Sage Direction Center blockhouse reportedly repurposed as a turkey processing plant near Sioux City Municipal Airport in Sioux City, Woodbury County, Iowa. Location: Adjacent to Sioux City Municipal Airport, Sioux City, Woodbury County, Iowa. Winkler, David F., Searching the Skies: the Legacy of the United States Cold War Defense Radar Program, USAF Hq Air Combat Command, 1997, 192 pages, Pdf, page 115. Cornett, Lloyd H. & Johnson, Mildred W., A Handbook of Aerospace Defense Organization (1946-1980), Office of History ADC, Peterson AFB, Colorado, 31 Dec 1980, 179 pages, Pdf. Ulmann, Bernd, AN/FSQ-7:the computer that shaped the Cold War, 2014, Walter de Gruyter GmbH & Co KG, ISBN 978-3-486-72766-1, 272 pages, Table 4-1, Page 77. This page was last modified 09:09, 26 March 2019 by John Stanton.